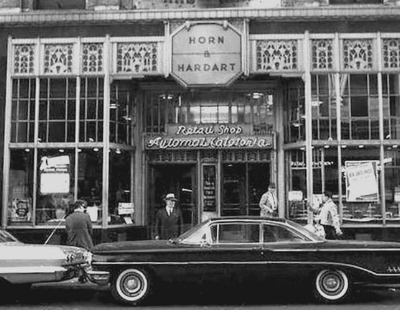 The history of Horn & Hardart began when Joe Horn and Frank Hardart became partners in a small coffee shop in Philadelphia in 1888. Over the next ten years they opened a half-dozen more, adding to the number of items on the menu and increasing the size of each restaurant. Throughout its growth, Horn & Hardart was always focused on quality coffee, and became known as having the best coffee on the East Coast. In 1902 the company opened its first AUTOMAT on Chestnut Street in Philadelphia. The Automat was based on a European “Waiterless Restaurant” but highly modified for the United States. Ten years later the first Automat was opened on Times Square in New York. From this point on, Automats became ubiquitous in NY and were highly integrated into city life. Even though the chain eventually grew to almost 50 locations in Philadelphia, it became highly identified with New York where it grew to over 100 locations by the 1950’s, some enormous in size. In the 1980’s the chain struggled in both NY and Philadelphia due to numerous reasons; some within its control and some external. Among the circumstances over which the company had little or no control were: population shifts to the suburbs, rising competition from fast food chains, rising costs of maintaining their large restaurants and changes in dining habits. The last restaurants closed in both Philadelphia and New York by 1991. 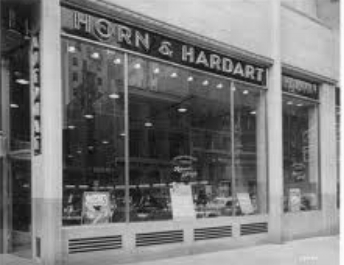 The Mazzone family were investors in an attempt to bring back the chain in the early 1990’s, selling a range of favorite Horn and Hardart recipes through supermarket channels. In 2009 the family began a years long process of acquiring all the rights to the Horn & Hardart name and recipes. They decided to focus on the coffee, and after several years of research and experimentation, were finally able to duplicate the original H&H coffee blend. Horn & Hardart was around for the "First Wave", the Second Wave, and now the Third Wave of coffee culture. What has remained the same is our commitment to quality and value.